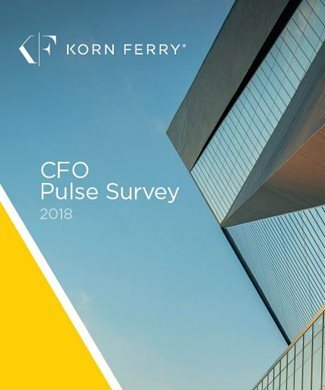 Korn Ferry’s Financial Officers Practice surveyed over 700 Chief Financial Officers (CFOs) globally to understand their perspective on the role and the major trends impacting the finance function. This report is separated into three sections based on the themes that emerged from the findings: the need to focus on succession planning, continued transformation in finance, and the rise of analytics and business intelligence in finance. 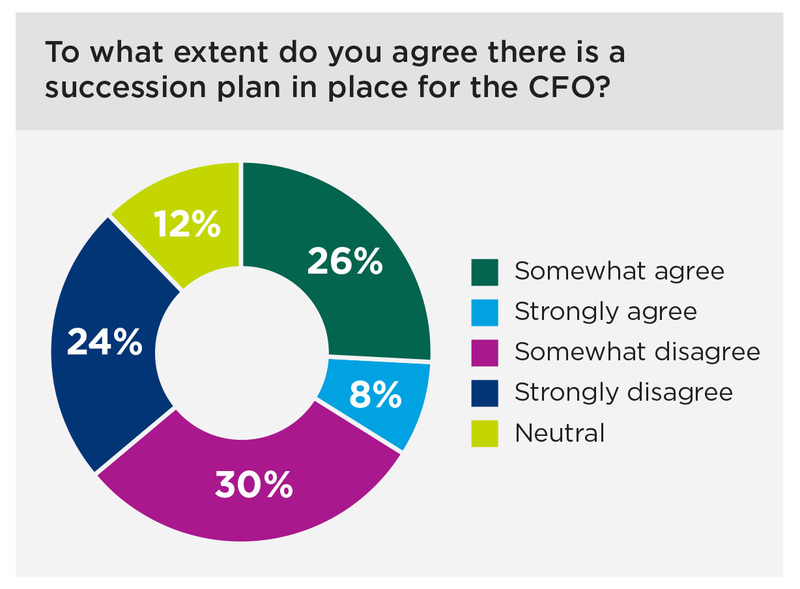 The 2018 CFO Pulse Survey found that when it comes to planning for their successor, only 34% of CFOs agreed there is a succession plan in place for their role. 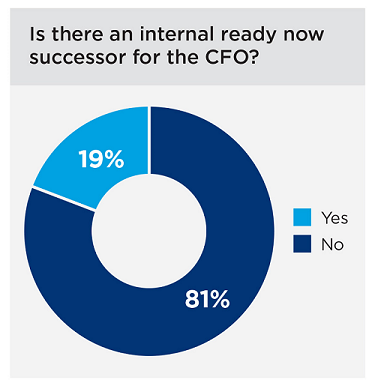 Further, when asked if there is an internal, ready now successor, 81% of CFOs reported there is none. 53% of CFOs who have been at their company for more than 10 years agree they have a succession plan. Public company CFOs reported their company is more likely to have a succession plan in place compared to private firms (46% compared to 28%). 31% reported leadership skills and executive presence are the number one capability CFOs focus on developing in direct reports. When asked what part of the finance function most needs a talent transformation, 22% of respondents reported Operational Finance, followed by FP&A (19%) and Strategic Planning/M&A (16%). that keeps them up at night? Nice try! The correct answer is "lack of organizational alignment." Correct! 18% of CFOs reported "lack of organizational alignment" as the #1 thing that keeps them up at night. The survey also found shifts in how CFOs are structuring the Finance/Accounting function with 55% of CFOs reporting they combined roles in the function within the past year. When asked why the roles were combined, the most common reason was related to talent (41%) with half (50%) stating it was due to lack of resources or skills and half (50%) for career development opportunities. When it came to which functions were being combined, respondents reported FP&A was the most common function, followed by Financial Reporting and Operational Finance. Another common theme in the results is the importance of analytics and business intelligence (BI) within Finance. When it comes to execution and leveraging data, an overwhelming majority of CFOs (84%) reported they are leveraging data. The most common use of BI reported is to optimize operations to improve the bottom line (64%), followed by evaluate risk to advise on appropriate actions (36%), and analyze customer behavior to drive decisions (26%). What did CFOs report is their biggest strategic priority this year? 31% of CFOs reported "data and analytics" as their biggest strategic priority this year. What did CFOs report as the most important capability they are focusing on developing within their direct reports? "Leadership skills and executive presence", "strategic thinking", and "data and business intelligence skills" are the top three capabilities CFOs are focusing on developing in direct reports. Korn Ferry surveyed more than 700 Chief Financial Officers from major corporations across the globe. Please note, percentages do not always equal 100 percent due to rounding. Korn Ferry’s Financial Officer Center of Expertise assists companies in attracting, developing, and optimizing exemplary Chief Financial Officers and senior finance executives who possess best-in-class leadership, finance, and operational skills. We offer a full range of solutions designed specifically to address CFO talent needs—from strategic search services, competency-based assessments, and engaging, interactive high-potential leadership development programs to one-on-one coaching, strategic talent design, and succession planning.